I dig personality tests, leadership style assessments … sociology and psychology in general. I enjoy learning about myself and how I interact with other people, as well as how others interact (though I haven’t made the time to think on this in a long while). So, when our friend Derek from Brandywine Printing asked us to join him in taking the Passion Test, it was a quick yes from me. It wasn’t anything like what I expected. No vague leading questions, no analyzing inkblots, no filling in tiny bubbles. It was all about what I said…what I want in life, and what is most important to me. Wait, now it sounds like a pointless exercise. I mean, every self-respecting business owner knows what they want in life, right? Well, sure, I can tell you what I want out of life. But until recently, I didn’t have it laid out for me like my own personal life roadmap. Derek (on his second time taking the Passion Test) says that when he started making decisions based on his passions, he found his mood happier and his life in balance. Balance…with a company, a husband, and two children, I have to say that balance is something to which I constantly aspire. I am truly excited about the prospect of remaining in balance because of following my passions. As a husband and wife team, we absolutely have to be on the same page…in our personal life and our business life. But I have to say that I assumed that our individual passions would be mostly in line. It took us several weeks to make the quiet time to share our passions (something we are both actually passionate about improving!). And when I looked down John’s list, it was both inspiring and validating to see nearly identical passions. 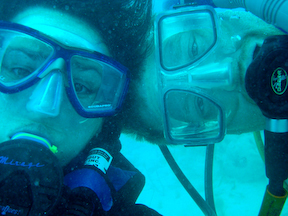 Us following one of our passions...scuba diving. We’re living our lives in a way that is aligned with our passions. But now we have a sort of check and balance system as we make decisions. “Does this deserve my attention?” is a question I now ask daily. Will the Passion Test be life-altering for us? Because we were already headed down the right path, maybe not. But if it will it help me achieve more clarity and balance, I’m so on board. During our session, we learned that only 20% of working Americans are passionate about what they do…if you’re reading this, I hope you’re in that 20%. I’m glad that we’re in that 20%. But if your life is not in line with your passions, how will you find personal or business success? It’s a new year. Make this one yours. Find your passion. My brownie made me do it. Our seven-year-old is a Brownie Girl Scout (and a former Montessori kid) and I swear she secretly has the Three Rs emblazoned on her chest like Superwoman. Reduce, reuse, recycle…Repeat! She is saving the world one bottle at a time. Before kids, we considered ourselves as earth-friendly as the next couple..we never littered and occasionally did a shoreline cleanup. While we’re not composting (who has time for a garden?) or driving a hybrid (though we’ve wrapped a few! ), our environmental awareness has definitely been stepped up a few notches lately. We now haul our recycling to the recycling center (no one picks up out in the boonies! ), we use the happy little reusable grocery bags instead of plastic, and we find infinite uses for things that were once headed for the dump. I even find myself now carting my plastic bottles home to recycle rather then throwing them away while I’m out (something for which I scoffed at a friend about a year ago!). So, we were enjoying networking at a Chamber function last month with about 150 local business people when we looked around and noticed all of the bottles and cans people were tossing in the garbage. The little Brownie Girl Scout in my head screamed “nooooooo!” That’s when we strolled over to our favorite Chamber folks and asked if we could bring recycling bins to the Business After Hours events to collect the bottles and cans. They wanted to know how much we would charge! Umm…nothing? We just don’t want to see all of those recyclables in the trash! So, we set up the first recycling bins at the Business After Hours at Wakoola Water Gardens (if you haven’t been there, it is amazingly beautiful). With no communication about the new bins other than the signs on the side, we got a great response. I’m planning an article for the Chamber newsletter so that people will begin to look for them next month. AND, our Brownie was very pleased…but not just about the recycling. She was thrilled to rifle through the cans pulling pop-tops…her latest venture in support of the Ronald McDonald House. That little Brownie…. Shaklee distributor Tiffany Moen does her part to recycle at last month’s Business After Hours. Interestingly, Tiffany is a huge proponent of recycling and educates families about getting clean the “green” way through Shaklee’s environmentally-friendly cleaning products. The indepthwraps.com Pacifica waiting to unload at the recycling center. When we say that we work weekends here at In-Depth, we’re not just talking about coming in for a few hours on Saturday. Let’s take this weekend. Between Friday and Sunday, we partially wrapped a race car, a van, a bucket truck, and a pickup truck, traveling from Alpharetta to Jasper. But we’re a FAMILY-owned business, right? So… in between those vehicle wrap installations, we also went to a Girl Scout skating party and a Dizzy Dean kids’ day at Turner Field. It sure is hard for me to type out the theme song to the circus…but “da-da-da-duh–da-da-da-da-da-duh”. Husband and wife team, huh? So, why haven’t you killed each other yet? We get this question a lot. Did I say a lot? I mean ALL the time, seriously. Seems like as soon as people find out that we’re married AND in business together, we get that knowing smirk…then they ask. Anyway, maybe it’s the fact that we were friends before we dated, dated awhile before we married, were married a little while before we embarked on this journey we call “the business”…maybe that’s the reason we haven’t killed each other yet. So…perhaps we’re just such a sweet and perfect couple? Umm, sadly no. That’s not it. We are sweet…well, wait…the female part of we is sweet. :) But like other couples, we do drive each other crazy on occasion, and we are FAR from perfect. Maybe it’s the fact that we are so different, we can respect each other’s unique abilities. He’s incredible at business and big picture concepts (like how to manage large fleet graphic projects, which I still can’t get my arms around) and I’m great at marketing and creative stuff like designing vehicle wraps and tiny detail-oriented things like trimming graphics perfectly. (though he’s catching up to me on both accounts…) I’ve always thought that was why we’re still having fun in the midst of all of this craziness (and why we’re both still living). Don’t get me wrong. We still argue…over the normal stuff…and then the business stuff. Hopefully, the funny bits of those arguments will find their way into our blog. Welcome to our blog. We’re gonna blog about what we know best…running a business together, running a family together…enjoying our crazy life.